Fashion does not stand still. Changes are subject to all aspects of our lives, and design methods for arrangement of dwellings were no exception. Modern ways of creating a practical, convenient, comfortable and aesthetic space comes with the new season. 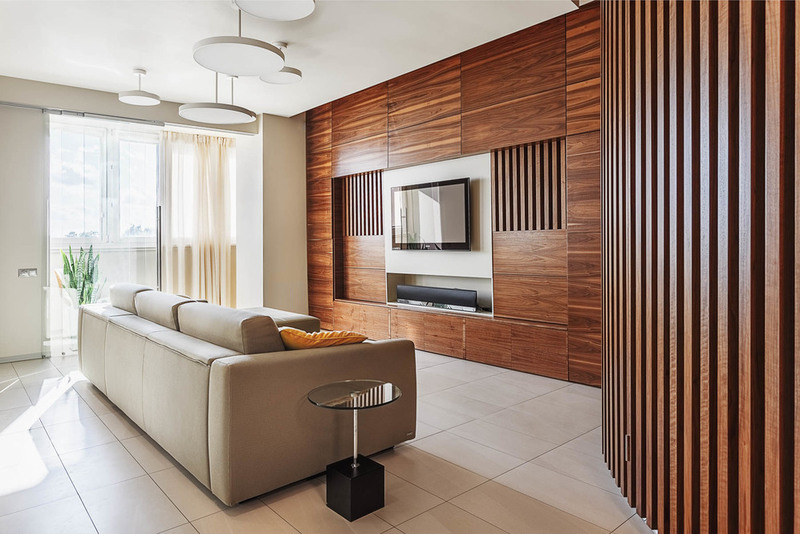 Current color palette, furniture design trends, ways to build functional areas, a lot of decorating options – all this and more in a wide selection of the most current apartments and condos design projects 2016.
compliance with modern trends of interior decoration. The combination of kitchen, dining and living zones within one large premise is a frequent design method for modern apartments. It often happens that the room to locate so diverse company of functional segments cannot boast of a large number of square meters. The best “helpers” in this case will appear light decoration of the ceiling and walls combined with dark flooring, built-in storage, lightweight models of furniture for dining groups and using of mainly wall decor. Usually, during the formation of areas with multiple zones common solutions of trimming used. The most simple and universal way of finishing is to use a snow-white painted walls and light laminate as a floor covering. In the kitchen area would be logical to use ceramic tiles for finishing of the splashback. The same kind of lining, but using porcelain can be applied for the floor tiling in the area of ​​kitchen worktops segment. Here is an example of an apartments design project, where living room is combined with kitchen and dining room in an eclectic design. Kitchen segment became accentual and a focal center of the room, despite the use of colorful decoration and other functional areas. Motley tiles suits for decoration of the kitchen space much more than common decoration in the other room. However the design of the work area does not look alien, aloof, being harmoniously woven into the overall canvas of the interior. The combination of multiple functional segments is possible not only in the living room. 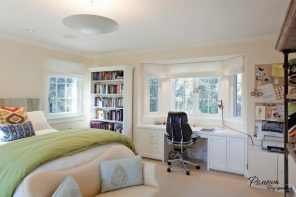 For example, in the bedroom, you can arrange a mini-study or dressing room. Workplace of the home office can be used as a dressing table. 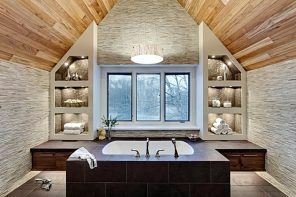 Some apartment owners prefer to equip a bathroom directly in the bedrooms, separating the segment by translucent partitions or by using an open-plan at all. Among the color palette of contemporary design projects you can clearly identify the three leaders – white, black and gray. It is logical that the snow-white finish is selected for the background color as the core, and the dark interior elements are the often used as the complex of contrasting combinations. Gray increasingly serves in the diversity of its hues as the main and the only color solution for space design. An effective method of “dilution” of received very cool palette is the introduction of interior items and surfaces made of wood or its imitation. Using white as a background, and black for decoration accents in the interior is one of the most popular ways to solve the dilemma of coloring. 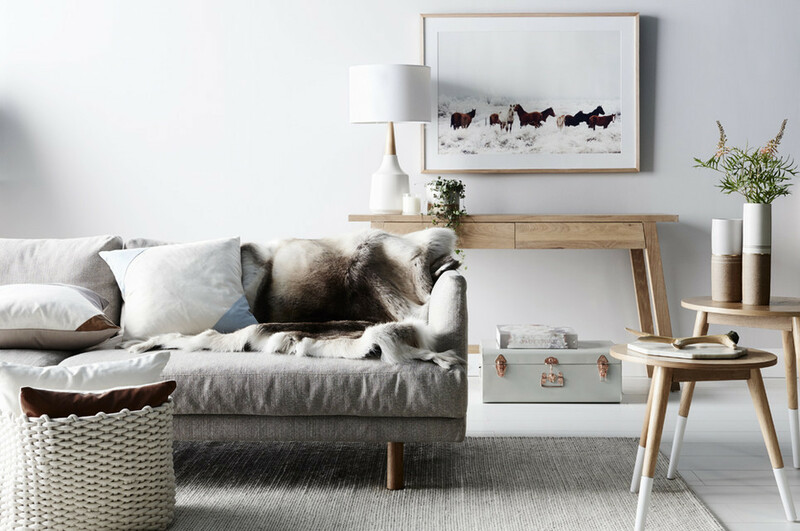 The snow-white finish is not out of fashion ever thanks to its versatility – bright surface visually expand the space and fits perfectly all shades of furniture and decor. White not only perfectly conceals flaws and even finish construction of the facility, but also to create a bright and clear image of the space. But to live in a completely white flat would impossible – our eyes need clear lines and shapes, color accents. For these purposes we use dark, contrasting shades. The black furniture on a white background looks particularly expressive, stylish. Of course, the care for black surfaces will require more effort in the area of ​​kitchen and dining room, but produced effect of such a contrasting combination is worthy. White-black combinations are relevant for living room either. Especially given that most family rooms have a video area with a black TV screen. It will only have to pick up “supplementary” elements for it. It may be dark flooring, wenge furniture or custom lighting with black shades and bases. Wood surfaces and interior elements perfectly suited for combinations in black and white interior. Natural color and pattern allows you to bring enough heat in the cool palette of the room. Even artificial materials successfully imitating natural ones are able to raise the degree of the color temperature in a modern space. Black and white room interior can effectively dilute one striking element. It can be a colorful sofa or chair upholstery, a lighting fixture or carpet. Yellow looks stylish and modern in the company of black and white space design. 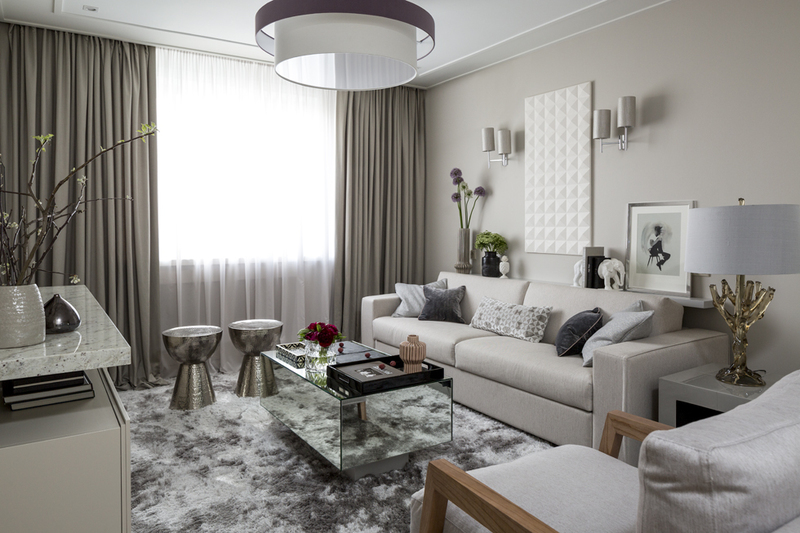 Depending on its shade, gray is able to create a luxurious, elegant and easy-neutral design of the room. Versatility of gray shades is that it is suitable for any environment, starting from the hallway and ending with a bedroom. Perhaps only for the decoration of a child’s room or nursery you should avoid gray. But even in this case, you can use bright accents, colorful decor with themes from favorite cartoon characters and fairy tales. Gray furniture is a mainstream of modernity. Against the backdrop of white walls, not only storage, but also soft furnishings upholstered in shades of gray look great. This universal color scheme have the liking of both households and guests of the apartment. Gray color helps create a calm, relaxed atmosphere, which is able to adapt to any person’s temperament. Only one bright design element looks particularly impressive in the interior sufficed only different shades of gray. In the bedroom it can be a veil or curtain, chair or bedside table, table-stand or stool at the foot of the bed. White never goes out of fashion. Snowy finishing and furnishing is impractical in terms of the care option of premises` arrangement only at first glance. In addition to its visual qualities, most of the finishing white materials is easy to clean. But the white atmosphere of any room needs an accent color. These can be natural plants, household appliances, furniture upholstery, carpet and other textile solutions. 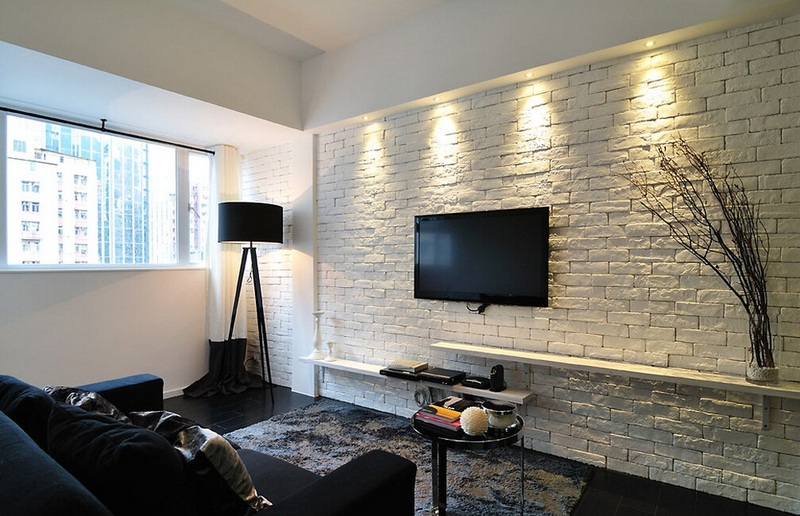 With wall decor, you can easily change the white trimmed apartment`s atmosphere. The simplest and easily replaceable way to integrate bright accents into white finished premises is textile design. For example, in the bedroom you can use colorful shades for the drapery of windows and bed – coverlet, decorative pillows and even linens can act as an accent, the focal center. 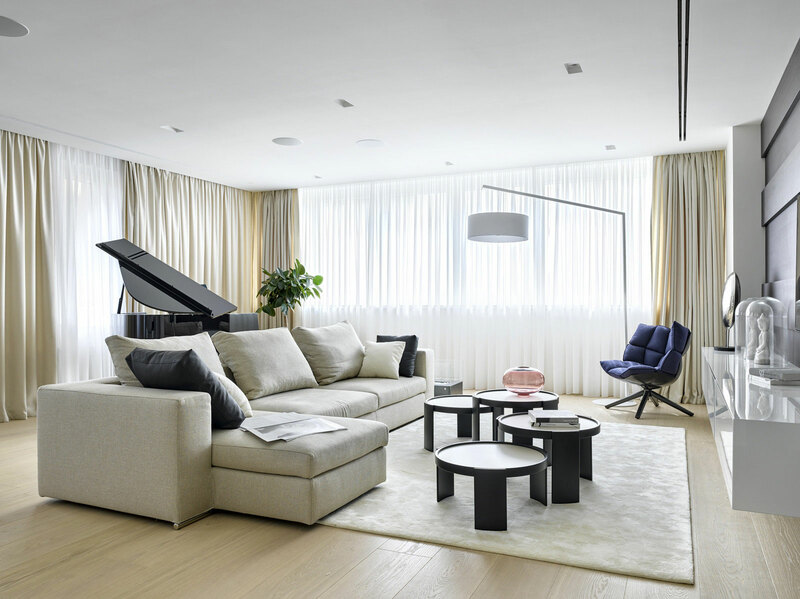 In the interior of the white designed living room can be used textile cushions, wall decor and lighting as the bright accents. To change the situation in the family room you only have to replace the blankets and pillows to buy new carpet. The problem question of saving storage space is very acute even for apartments with improved planning. Using the built-in furniture helps to allocate the maximum number of storage and work surfaces on a minimum number of square meters. For example, the location of the ceiling-height cabinets in the kitchen area to create a roomy storage system which would be interleaved only with the integration of appliances and work surfaces. The idea of ​​integrated storage systems can be effectively used in the living room. Around the video area, you can successfully build a large wardrobe, which consists of separate modules, to hide not only all of the wires and equipment, but also a lot of useful things in the economy, which the owners of apartments do not want to flaunt. The planning of the living room rest zones can not do without upholstery. The modern design projects are increasingly giving the preference to only one, but a large sofa. 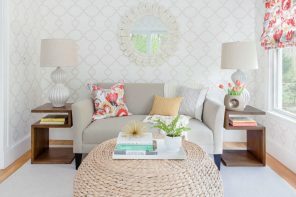 If the space of the living room already has an upholstered furniture, then it is usually chosen in the eclectic style – different models, upholstered in a variety of materials. The largest number of seats is able to provide a sofa. If the model has the sliding mechanism, such a soft zone can become bed for guests staying for the night. The simplicity and conciseness is the motto of the modern style. Strict forms and simple design decisions are involved and in the furnishing of apartments. Clean lines of the furniture look particularly expressive in the bright and airy room. There is nothing superfluous, but the room is comfortable, functional and visually appealing. Furniture made of glass and transparent plastic becomes an effective complement of modern interior. Lightweight, virtually weightless design is literally dissolving in the background of bright decoration. However it perfectly performs its basic functions, is robust and reliable subject of additional furniture. White furniture is always relevant. Apart from the fact that even the most monumental structure of white are less bulky. White color creates an incredibly bright and clean image of the entire room. Storage of the living room and bedroom, kitchen furniture set and even the arrangement of the workplace in the office – white is topical always and everywhere. It is very often homeowners have to get rid of the interior walls to achieve the feeling of spaciousness in urban apartments of common layout. But in this case the owners faces a problem of location of several functional segments in the same room. Often, even the sleeping area becomes a part of the overall space. But most often kitchen, dining room, living room, office space, a library, and sometimes even an entry are subjected to conjunction. Here is an example of combining living area, kitchen and dining room in one small space. Due to the snow-white finish and most of the furniture, as well as the right balance of color accents, the space appears larger than it actually is, while keeping the functionality, comfort and aesthetic appeal. In case if you have to combine the living room and bedroom, white finish also becomes the main asset of small spaces. Cleverly placed color accents avoid associations with sterile operating rooms, create a cozy and comfortable atmosphere. 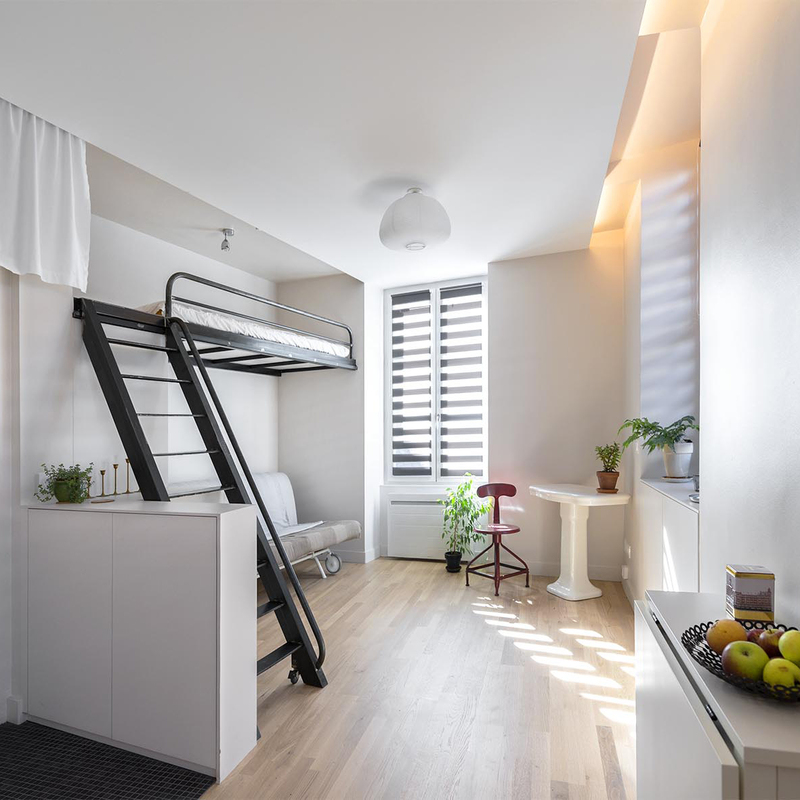 Here is another example of a small studio apartment, where rest and sleep zones, working place, living room, kitchen and hallway are located in the same area​​. Only a bathroom space is segregated. In addition to use of a light finish for visual increasing of the space there are glass, mirror and a glossy surfaces can be used. For example, you can use glossy stretch ceilings to increase the height of the room. For the visual enlargement of bedrooms` and living rooms` space is expedient to use the entire mirror segments, which are located from floor to ceiling. Another way to save space is the use of two-tier structures. For example, a loft bed allows you to create a sleeper on the upper level, and you`ll be able to locate a workplace, rest area, sofa or roomy storage below. In small common plan condos every square meter counts. A space near the window is rarely possible to use rationally. Here is an example of how you can use the area, which combines living room, kitchen and dining room. Comfortable and cozy place to sit with storage systems is not only practical design idea, but the highlight of the interior of a small apartment. One of the placing beds method in a studio apartment is zoning of functional segment with the help of interior partitions or at least curtains. This approach breaks down the concept of an open-plan, therefore condo loses some of its space. But for many owners of small apartments the isolation of the sleeping area is a necessary point.